Yo, Lucille Mazzarella here. Yesterday when I was over at the A&P to pick up some nice capicola for Frankie’s lunch, I started looking at one of them magazines they keep by the checkout. The gal in front of me had an item that didn’t have no price on it, so they had to send someone over to check what it was—turns out they sent Bruce and he ain’t too swift if you know what I mean—so I had plenty of time to read. You know what got to me? All these new words they use nowadays. We used to say a girl had a dynamite figure—like Brenda Zabaglione. She was what we used to call “va va voom.” Know what I mean? Plenty of curves in all the right places. But women don’t have figures no more, now they have “bikini bodies.” What on earth does that mean? Politicians used to swear they weren’t telling us no lies, not that I ever really believed them, but now they call it being “transparent.” Like what? Casper the Ghost? Not that I want to go back to the old days when you had to do the dishes by hand and put your clothes through a ringer. No, thanks. I guess I’ll keep running and try to catch up. 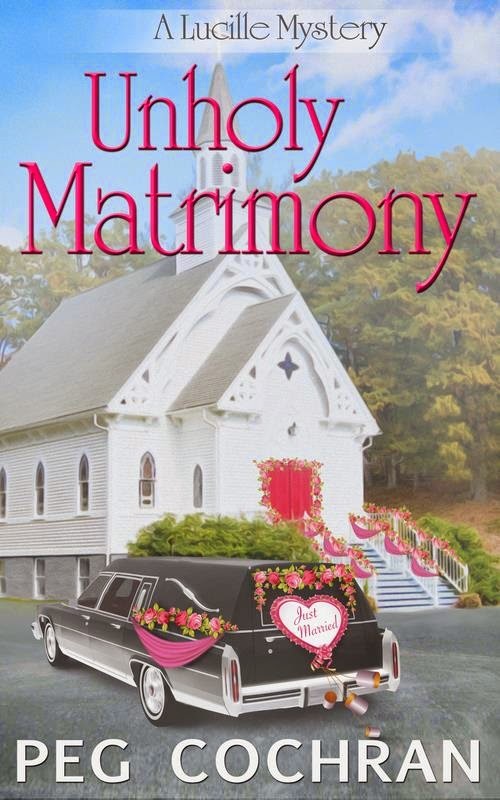 In honor of the Cozy Days of Summer, I'm giving away a copy of Unholy Matrimony--the second book in my Lucille series. It is available for all e-readers. Leave a comment with your email, and I will contact the winner. Remember! You have until midnight tonight to enter this giveaway! Stop by my web site or my Facebook page and check out my other series "The Gourmet De-Lite series" and "The Sweet Nothings Lingerie series" written as Meg London. Sounds good....someone else running to catch up.....Looking forward to following along! I loved your post. Not only do we have new words but some words are used the wrong way and we all accept it. We were just talking about how words have changed! Like the meanings of some words have changed so much that we don't like those words anymore. Thanks for the post! sounds cute!! and she's right!!! the words we come up with. LOL at baby daddies. She sounds like a hoot. Sounds like fun. I'd love to win a copy! Really enjoy the Sweet Nothings series. Would love to try this one. I can relate to all of Lucille's comments. I, personally, have never used a wringer washer, but I grew up with my mother using one. Lucille, I know just what you mean! Looks like another great mystery to give away! Sounds like a good book to add to reading list. Lucille must be my age - and not going to reveal that! I finally have smart phone...yay. But, I still have never taken a selfie. Must be the only one who hasn't. Can't see the point. I must be getting old, too---I remember using all those expressions. It sure is hard to keep up with the changing language, isn't it Lucille? Usually by the time I get the meaning of a new saying, or figure out what something is now being called, it goes and changes again. Sure glad I have an adult granddaughter that can usually keep me updated. Her 'baby bump' isn't too big yet tho. I love the title, going on my wish list !